The direct extrusion, in the simultaneous production of two distinct operations such as COMPOUNDING + EXTRUSION in one single step, has become a key theme in the present market conditions. The reason, simple but obvious, is that the reduction of production costs in this period of a more and more challenging market, does overcome the obstacle of the use of a more complex technology. What is it: simply (for those who are familiar with the compounding) in separate feeding of each individual component of the formulation, in different points of the 'extruder, depending on the technological requirement of the process. 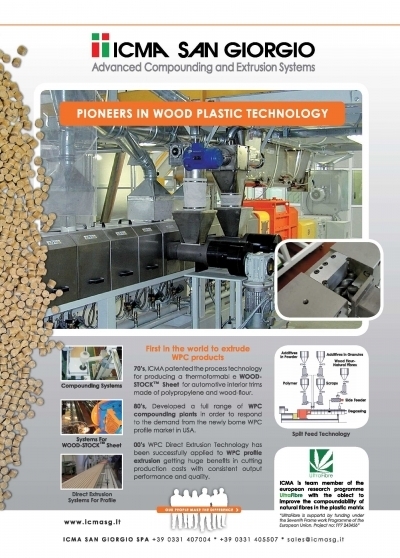 In the specific case of the WPC, this consists in feeding the wood flour separately, in a side feeder positioned downstream of the main one, to shorten the residence time and to avoid the degradation of wood that is very temperature sensitive.